Most people now know they should be eating 5 portions of fruit and vegetables each day. There’s often confusion though around what is a portion, exactly why it’s important to include them and how to incorporate into meals. Those on a budget sometimes feel it’s expensive to buy for a family and so don’t add them to the shopping trolley. Here then are the top 5 tips to ensuring it’s easy to include 5 a day into your life. 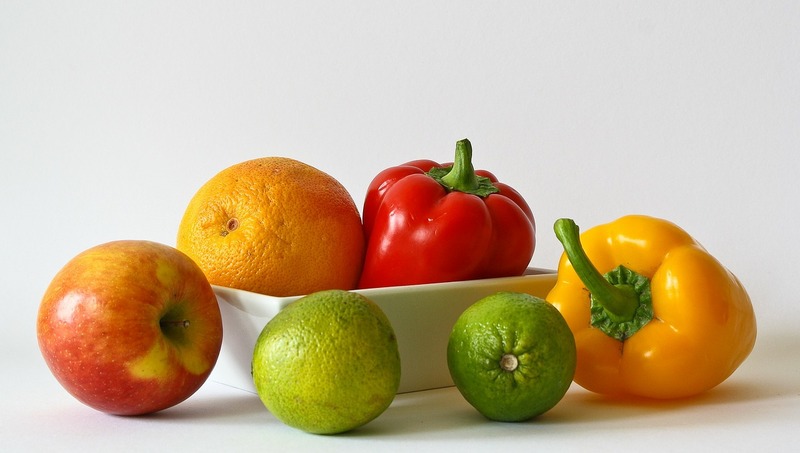 Fruit and vegetables are packed with vitamins to keep us healthy. They also contain fibre which keep our digestive system working and protect against conditions such as constipation. Eating fruit and vegetables each day also helps ward off heart disease, diabetes and some cancers. Whilst fresh is best with fruit and vegetables, it doesn’t matter if they are frozen, canned, dried or an unsweetened juice. Fruit and vegetables can be included in all meals or as healthy snacks. Chopped up on cereal or pureed into a juice, they make a delicious start to the day. Take a selection to work to snack on and experiment with packed lunches with slices of raw pepper, celery and cucumber mixed with grains such as cous cous. For dinner, there’s lots of ways to add them to any meal such as vegetable curries, a colourful pot of ratatouille or served as a side dish. If your children are fussy eaters, try chopping vegetables finely and adding to bolognaise or into shepherd’s pie. Baked beans and dried fruit count and most children will happily eat both. Some feel that it’s too expensive to buy fresh fruit and vegetables. If you’re replacing processed foods and ready meals with healthy options though, you won’t spend much more money and there’s every chance you’ll save as you’ll buy more bulk items which can be used for a greater number of meals. Look to fill the cupboards with tins of vegetables to pay less but eat just as much goodness. Staple options such as peas, carrots and sweetcorn are economical in price; check they are in water only though rather than sugared or salted brines. Popping to the shop at lunchtime means you won’t have much time to decide what you want and there will probably be little or no cooking facilities if you’re at work. If you’re buying from a sandwich bar, add as much salad as possible. Pick up some fresh fruit and unsweetened juice and you’ll be on your way to the 5 portions. It’s possible to add to your 5 a day whatever time it is and wherever you are. When you’re planning to eat, think to yourself – how can I add fruit or vegetables and you’ll often see there’s an easy option. It’s all about changing habits so if you don’t each much towards your target at the moment, do it gradually and it will quickly become natural to have salad when you’re in a restaurant at lunchtime or to offer healthy vegetable bakes to the family at night.